We're often asked what makes our products better than other trickle or float chargers on the market. It's easy – our patented Pulse Technology! 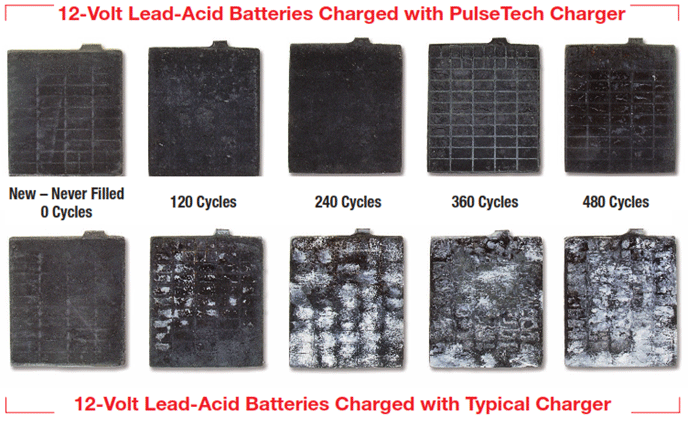 In addition to charging the battery, our patented Pulse Technology removes sulfates from the battery plates and prevents new ones from forming. No other chargers on the market have this technology. Our chargers have one circuit for charging PLUS a second separate circuit for our Pulse Technology providing a powerful one-two punch to the battery. Our chargers are UNIQUE in their ability to utilize this patented Pulse Technology. 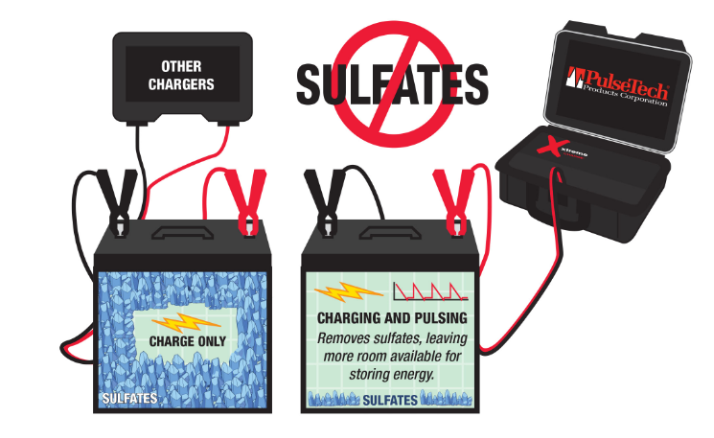 If you notice your battery's loss of power over time you have a build-up of sulfate crystals and should use our Pulse Technology to remove the sulfate crystals allowing more room for energy storage. Charging batteries is NOT enough. You must also attack the sulfate crystals or they'll eventually choke and kill your battery. Sulfation is the creation of lead sulfates. It is a natural and necessary part of a battery's life and occurs whenever the battery is in a state of discharge, i.e. whenever the battery is NOT charging. Over time as the battery discharges, the electrolyte solution inside the battery turns into water and the lead plates become covered with lead sulfate crystals. Sulfation is the main cause of battery problems and failure, on all types of lead acid batteries, including flooded, AGM, VRLA, Gel and flooded cell. Eliminating sulfate buildup from lead-acid battery plates improves battery performance and extends battery life up to 3 times. After the tire, the battery is the most expensive and difficult product to dispose of safely. Yet, it is estimated that over 80% of the batteries being discarded every year are only suffering from lead plates that are clogged with sulfate crystals. Imagine the contamination that prematurely dumping battery lead and sulfuric acid across the nation can cause. Then realize what a difference the implementation of Pulse Technology can make. By extending battery life and improving battery efficiency, the number of batteries prematurely discarded can be reduced considerably and the potential environmental damage can be avoided reducing both your carbon footprint and increasing adherence to corporate sustainability policies.